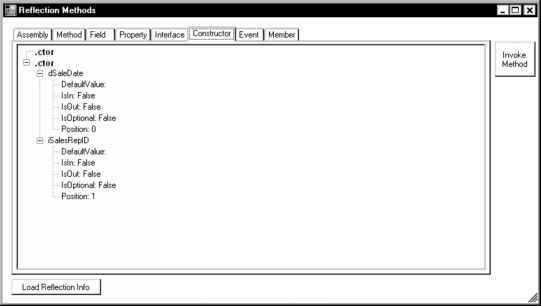 You can obtain a list of a class's constructors via the GetConstructors ( ) method. There is no need to return the name of the constructor because in C# and VB, all constructors default to the name of their class. They only differ by their signatures. Even if you don't explicitly create a class constructor, a default parameterless constructor is created for you at compile time, so you'll always see at least one. Listing 2-9 shows how you can display the constructors in a class as well as their parameters. Figure 2-6 shows the results of this query.